If you have not discovered Google Tasks, you should visit the Gmail Lab (under Settings) to turn on TASKS. When you read an email that includes a new item for your to do list, or important information needed to complete that tasks, just click on the Label button to assign this email to a task. Your task list will now contain items that are linked to any email related to that task. And the most satisfying part is being able to check off the tasks as you complete them. Learn more about how to use the Tasks feature in Gmail or on your mobile device in Google's Help Section. 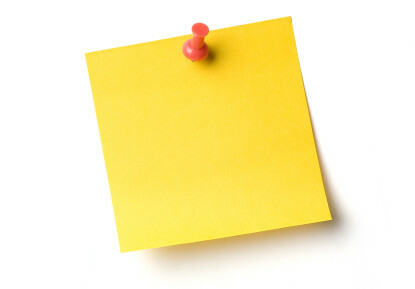 Whether you use a ToDo list such as Gmail's Tasks or other program to stay organized, there is something about a Sticky Note that helps us with priorities. This little gem is the perfect tool to keep certain items on your radar anytime. Jing Project is a very helpful program that can be used to make screen captures as still pictures or short 5 minute videos. A picture is worth a thousand words and taking a picture of what is on your computer screen and being able to add lines, arrows, highlights, and additional text really helps increase understanding or provides assessment documentation in digital format. I know some teachers who encourage students to take a screenshot of their work on a popular math game as evidence of learning. I use this tool all the time to create tutorials for students and colleagues. I've even seen some educators document a tech error using Jing and attach it to a help ticket. For $14.95 a year you can go pro which allows the movies to be saved in mp4 format and also saves the videos in smaller file format. This comes in handy when using Jing to gather assessment artifacts. If you want a similar tool that does not require you to install a program, try Screencast O matic. This tool allows you to create a video of your screen (screencast) without requiring you to install anything. The product is in beta right now. Zoom It is a very small utility that you can install on your computer or keep on a flash drive that will allow you to ZOOM in to any part of your screen at the stroke of a key. Those with Apple computers have had this ability for a while; PC users can now enjoy this capability with Zoom It. You can also provide it to visually impaired students to facilitate their use of computers. There are tools that provide more features for work stations used by visually impaired students, but this handy program on a thumb drive gives them the flexibility of zooming in when using other computers. And for an even more spectacular zooming experience, you need to try Prezi. And starting April 5, you'll get a chance since Prezi goes out of private beta and will be available for you to try the free version of sign up for a Pro account. It allows you to fly around a map of an image, screen shot, and even videos. You can click on an image to zoom in on it or use the mouse to fly around to show different perspective (from big picture to minute details). Enjoy these tools. Model how to use them effectively for teaching and learning for your peers and students.